First of all, let's destroy the piano as an incarnation of Western rationalism. Play the requiem, wear the death costume, prepare the hammer and chainsaw. The computer is listening to the agony of death in its last, bittersweet melody. 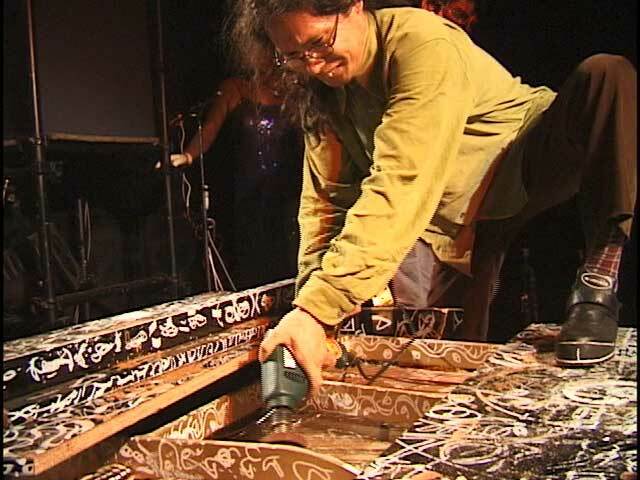 "Piano Dismantling Operations" is a live performance in which we destroy a grand piano by processing the acoustics of the destruction, using a computer. In this work, we don't use any so-called electric synthesized sounds or unrelated sampled sounds. What you hear is the sound of the piano itself, the noise that the tools make as well as the real-time computer processed sounds. Of all the musical instruments, pianos are the most extreme incarnation of western rationalism. The keys are lined up in regular order, the extremely wide register matches an orchestra's, the tuning by equal temperament is done so because of cost priorities, there is a minute action of the hammers and the pedals, the steel frame supports the inside, there are taut wires, and the quality of the wood and the coating is important. Whichever factor you examine, the mechanism which has such cumbrous complexity is integrated with rational thought, but dressed in transcendental decoration. Pianos are analog computers designed in the name of musical instrument and also polished up, machine devised tyrannosaurus at the same time. Thus pianos have become too uncomfortable and dull now although we pay our respects to their ability and history. 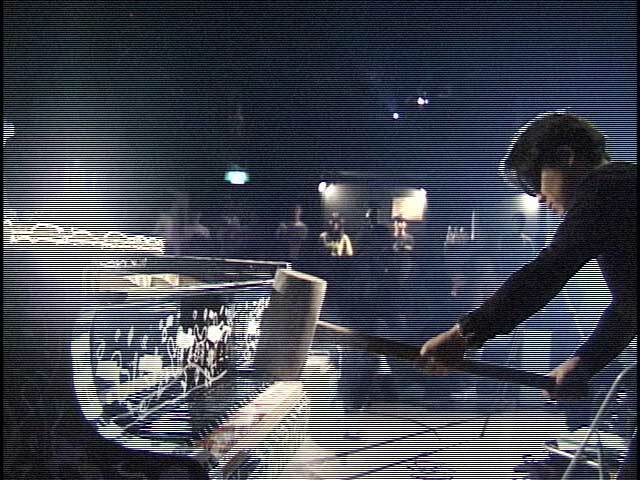 So, lets destroy a piano. We might be too much dipped in rationalism from the moment of our birth to escape from the spell by only destroying pianos. But we may feel a little lighter. Meanwhile we are living being surrounded by digital computers, which are the most advanced and complex tools that were given by western rationalism. In our present society, there is no one who can be not related to any computers although you don't touch pianos unless you are a musician. We are able to destroy pianos however we haven't made up our minds to destroy computers yet. Computers are similar to pianos. Computers construct information with accurate lines of bits as pianos construct music from the orderly lines of the keys. The mechanism inside the pianos and the computer circuits are similar figures changing the phase. People make computers roar information as if they spin music from pianos. Computers are indispensable as prop of present information society like pianos played an important role in modern western music. Therefore we decided to make computers which are half brothers of pianos be present at the pianos' death as we decided to destroy pianos. It is proper for the death of pianos, and also the role of computers. It's both dismantling of music and a battle of information. Will we destroy computers someday? 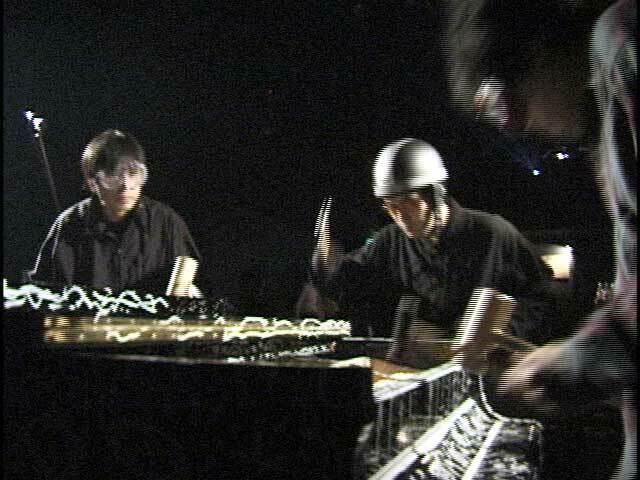 "Piano Dismantling Operations" is roughly devised into the performance before the dismantlement and the one of the dismantlement itself. (A) The performance before the dismantlement is both a requiem and a funeral march, and it is held by the piano itself. There are 5 small short pieces played here as following. 1. 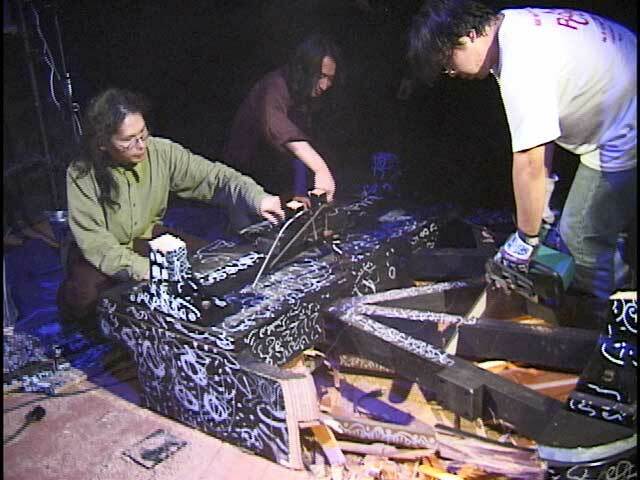 "Piano Painting" Death make-up is given to the piano. 2. "The Grudge of Piano" The homage for special rendition of the piano. 3. "Electric Piano" The piano wires, which are conductors, are sparked by being sent a high voltage electric current. 4. 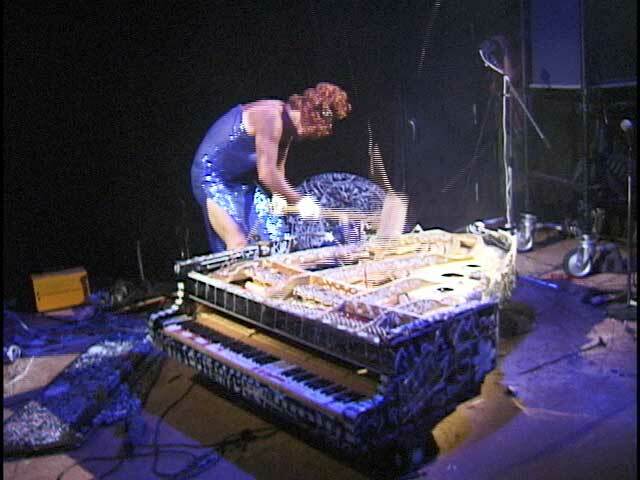 "Hammer Piano" Regarding the whole body of the piano as a percussion instrument, we keep on beating it. 5. "Farewell to Piano" The last respects are paid to the piano. 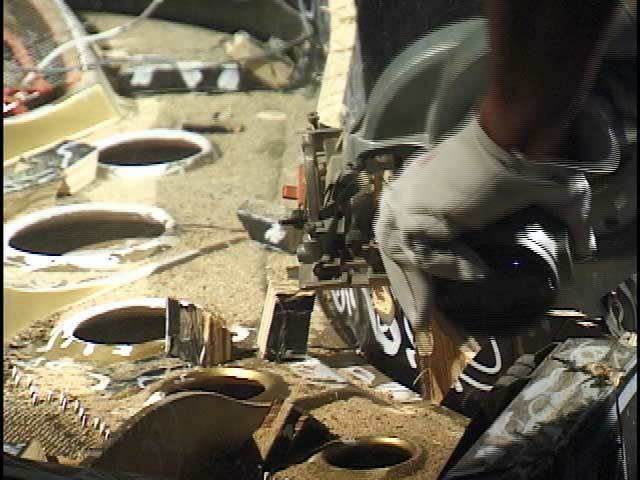 (B) The dismantlement of the piano is done not only by the electric tools like chain saws or electric drills but also by hand tools like hammers or axes. Naturally, there isn't any definite process in dismantlement of pianos, it comes to a continual series of trials and errors. 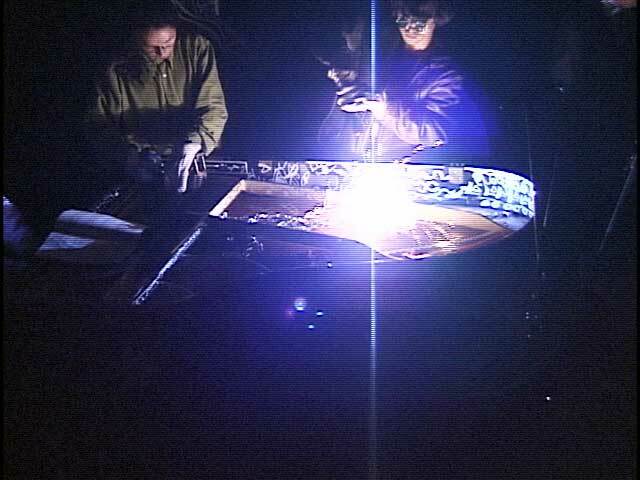 It is like investigating the unknown world groping our way in the dark and it also begins to reveal the mechanism of pianos that we don't normally realize. In addition, when the blades of the electric tools which was working remarkably become weak because of the hard usage, we gradually become to rely on hand tools from necessity. When it comes to the stage of cutting the piano wires which follows danger the tension builds up at a stretch, when you play the key of the piano which is half broken down, it causes the laughter of the audience. In this way, the piano dismantlement progress as a performance that has a strong character as a kind of story not as a mere process. 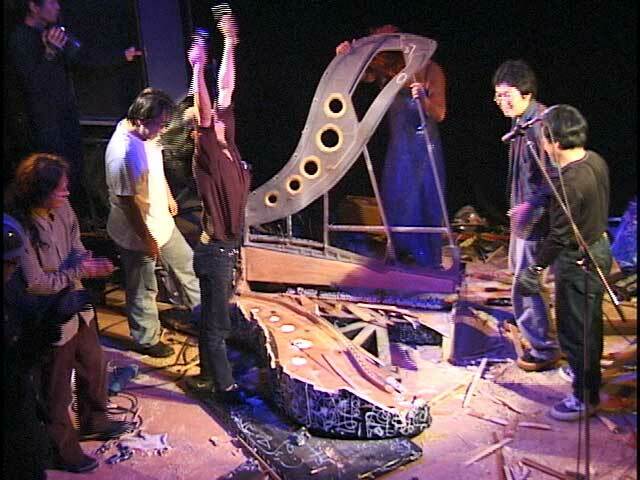 And finally, after the complete dismantlement of the piano, it comes to the curtain fall as the broken small pieces of the remains of the piano are distributed to the audience. 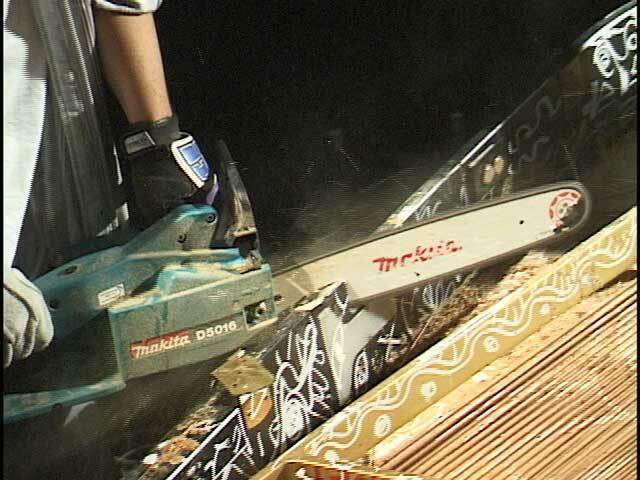 Here, I quote a few lines of a report that is written by a journalist who visited "Piano Dismantling Operations". "When I chanced to be present at the scene of the dismantlement, strangely, there is few feelings of objection against authority, violence and intense grief. It's rather a carnival. I felt that it was like hunting and defeating a beast with the whole village and sharing the delicious parts with everyone." 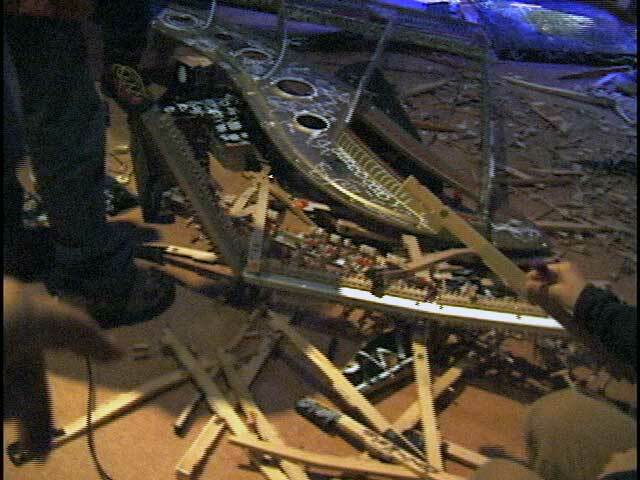 Dismantling pianos has been done several times although not so frequently before. But "Piano Dismantling Operations" is held not as Fluxus movement in 60's but with the technologies of the end of the 20th century. That is, the existence of the computer which calmly stares at the dismantlement is decisively different from the past performances. 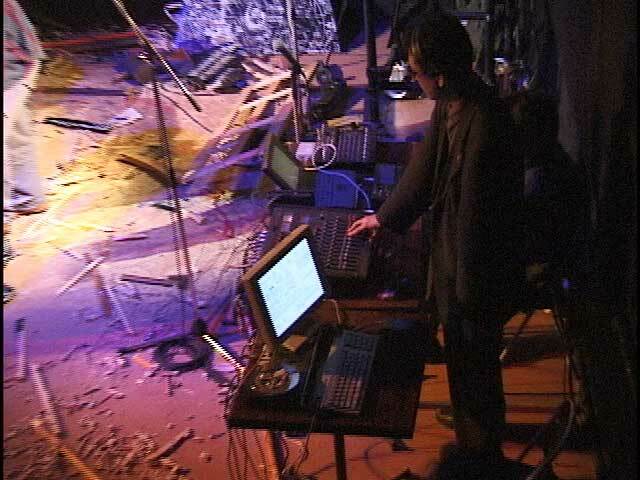 The brief summery of the computer system used in "Piano Dismantling Operations" is as following. Firstly, piezo pick ups are placed at several parts of the body of the piano, and they directly picks up the vibration of the piano. And also, there are some microphones standing around the piano to pick up the sound the piano makes. Those sound signals are taken into the computers through DA converters. Two computers are used here and they run the acoustic processing programs by Kyma System and Max+MSP respectively. 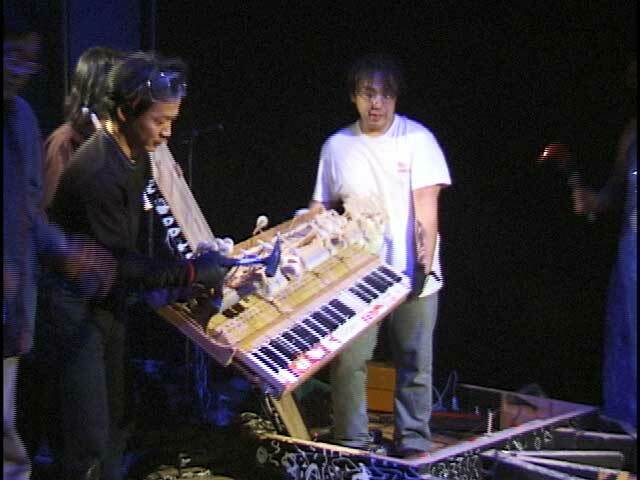 The operators "play" them by manipulating the parameter of the program responding the progress of the performance. The basic action of the program is to memorize the sound and noise that the piano and the tools make, process them in real time and playback them as reconstructed acoustic. However, it forms a harmonious surrounding and time as varieties of sound effect which is created by various sound processing technique is mixed up with the acoustic arising there.